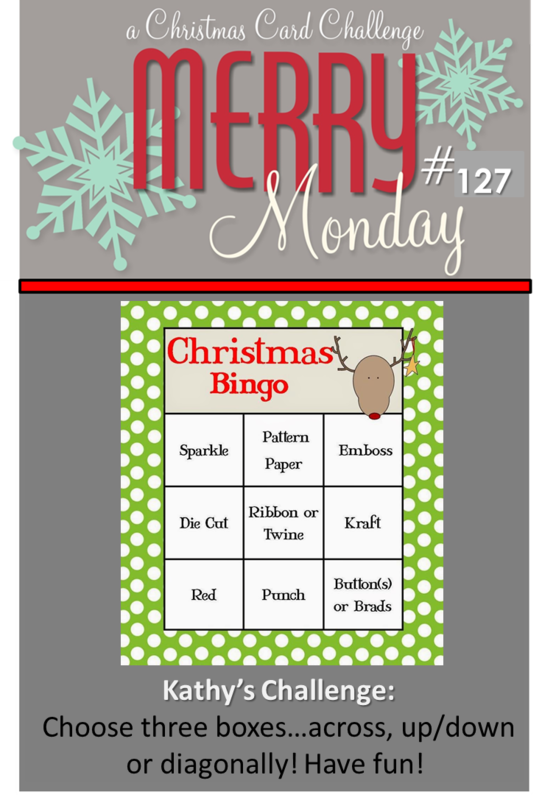 This week Kathy chose for us to play Christmas Bingo. Choose three boxes...across, up/down, diagonally! I chose the three boxes on the diagonal, Emboss, Ribbon/twine & red. I wasn't sure if I could capture the embossed ornaments in my photo but I succeeded. yay! I used an embossing folder (NBUS) by Darice. I didn't use the whole thing, just a portion of the piece to have it fit perfectly behind this Holiday Frame (NBUS) by SSS. I wasn't able to capture the Wink of Stella glimmer that I added to the ornaments but it is there. Since I used the Holiday Frame & Embossing folder, both of which have never been used, I am entering this over at Darnell's NBUS Challenge #2. Your card is just lovely! The red and white color scheme really packs a punch! Oh la la...I have this die! Fabulous card...can't wait to use my die too. Sooooo pretty! The embossed ornaments look amazing! The red frame really, REALLY showcases the ornaments as well as the pretty silver ribbon. Oh I totally love this Kristie! I have this die too and can't wait to try it out! Love how you did the ribbon! So pretty! Love this card, I have not used that die yet but love what you did with it! Gorgeous simplicity, Kristie - the framed embossing is gorgeous! Love it! So pretty Kristie, the embossed ornament looks lovely behind the frame. Dear Kristie thank you for visiting my blog and being my new follower. :-) I have seen a lot of your cards, and I'm impressed! I don't want to miss your creations, so I'm your new follower from today. Crisp and fresh--love this card. I was just eyeing this die at SSS. I love how you've used it with the embossed ornaments behind it! Awesome! Have a great week and stay warm! Kristie, love how you framed the embossed image - brilliant! Hope you have a super special week! Love the touch of silver - gorgeous! Hi Kristie!! This is perfectly wonderful!! I've not played along. . . yet! Gorgeous! I love the embossed ornaments in the photo frame. Just beautiful! The embossed ornaments inside the frame are genius!